At a Public Safety Committee Meeting on July 10, 2018 residents of neighborhoods adjacent to Jack Fisher Park creekbed expressed concern regarding ongoing, reported fires in the area. Santa Ana Police Department (SAPD) detectives working with Orange County Fire Authority (OCFA) investigators were already monitoring these reported incidents to establish if there was an ongoing series. Following the meeting, SAPD and OCFA formulated an immediate action plan that included, 24/7 monitoring of the area by police personnel along with fire investigators. SAPD and OCFA also worked collaboratively with the Orange Police and Fire Departments, as two fire incidents were reported in their city and possibly related to this series. According to reports from OCFA, there were four fires that appeared to have been intentionally set in the Jack Fisher Park and Santiago Creek area on Tuesday, July 10, 2018. Today, July 13, 2018 at approximately 11:40 a.m., SAPD and OCFA responded to a vegetation fire in Santiago Creek near 900 W. River Lane. As OCFA extinguished the fire, SAPD personnel immediately responded to the area in an attempt to locate the suspect. At approximately 1 p.m., officers located the suspect, identified as Gustavo Garcia 26 (Homeless), in the area and detained him after he was previously identified for setting other fires nearby. During the investigation, detectives were able to link several of the fires to Garcia. Garcia was later booked into the Santa Ana Jail for multiple felony counts of PC 451(c) & (d) Arson, which will be presented to the Orange County District Attorney’s Office for criminal filing consideration. The investigation is still ongoing and SAPD detectives and OCFA investigators have not ruled out the possibility of additional suspects. 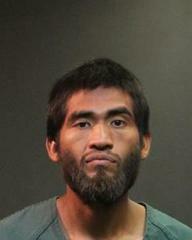 "The collaborative efforts of SAPD and OCFA led to the quick arrest of this suspect. These fires threatened residents in Santa Ana and are dangerous to the firefighters responding to them." OCFA Fire Chief Brian Fennessy. Between June 10 – July 13, 2018 there has been a total of 14 incidents that appeared to be related to this series, 12 of these fires were reported in the City of Santa Ana and two in the City of Orange. If you have any information about these intentional fires and/or additional suspects, please contact OCFA Fire Captain Lackey at (714) 573-6709 or SAPD Detective Castro (714) 245-8345.